Applications and users that have traditionally demanded conventional electromechanical claxons, sirens, buzzers and bells can now choose the next generation alternative. The technology employed in the E2S H range features the latest in amplifier and digital to analogue conversion technology. The E2S H series of products faithfully reproduce the sounds made by legacy electromechanical signalling devices but in a modern, reliable and cost effective way. With output levels of up to 124dB(A) at 1 meter the HMA121 surpasses legacy electromechanical devices in performance and effectiveness; The HMA121 is also continuously rated, requires zero maintenance and the signal quality will not degrade with age. 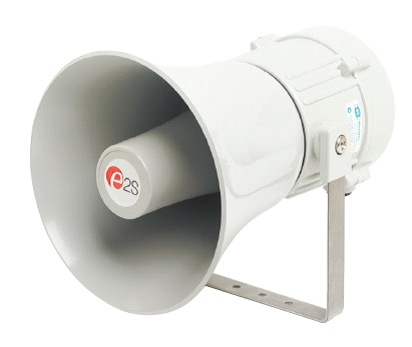 – Electronic horn/bell with 5 commonly used electromechanical sounds with 3 stage alarm. – Accurately reproduces electromechanical horn and bell sounds. – Sound Output: 121dB @ 1m at nominal voltage. – Sound Frequency: 5 tones selectable by DIP switches (2nd and 3rd stage by terminals). – Automatically synchronizes on multi-sounder systems (synchronization only occurs when sounders are connected to the same power supply). – Volume control (124dB max. – 115dB min.). – Construction: Flame retardant ABS; UV stabilized. ESS8210 HMA121 horn, 24VDC, 1.0A. ESS8220 HMA121 horn, 110VAC, 600mA. ESS8230 HMA121 horn, 230VAC, 500mA.